We've seen a lot of renderings, sketches, and speculative images, but this is different. the Gladiator means serious business. 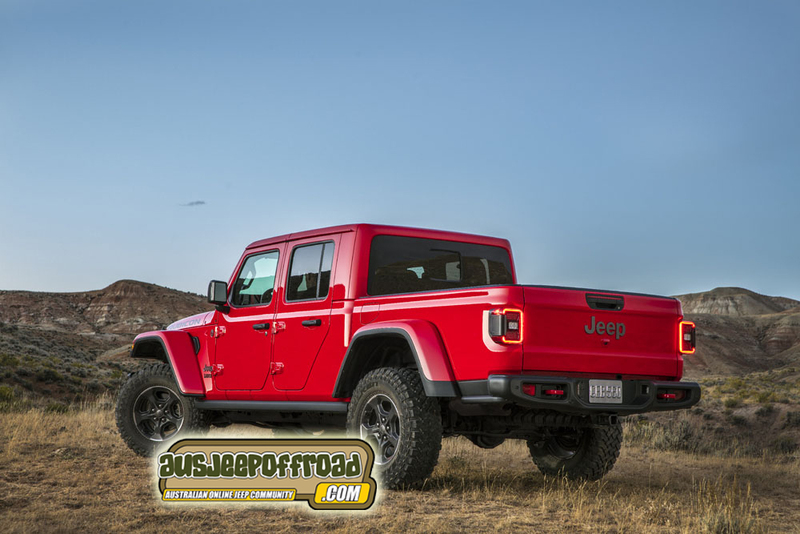 According to their inside sources, the JL Gladiator will offer the 3.6-liter Pentastar V6 (with eight-speed auto or six-speed stick) or the 3.0-liter EcoDiesel V6 (auto only, available in 2020). 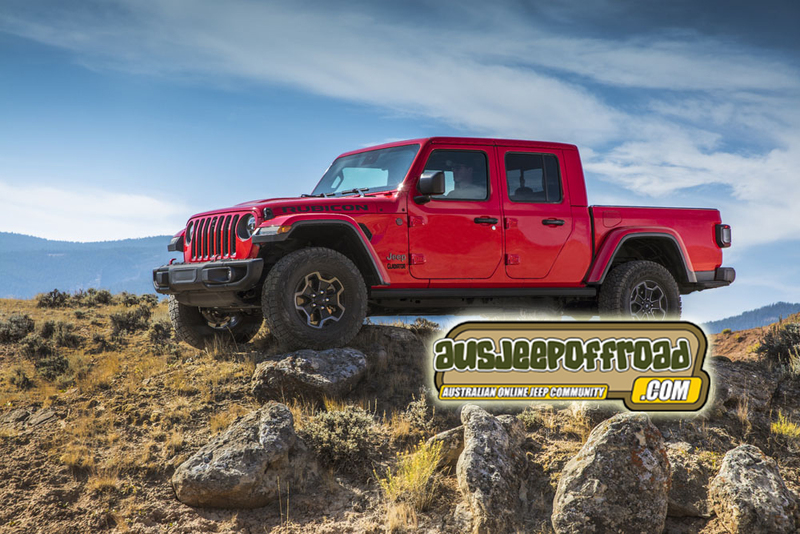 It'll tow up to 7650 lbs and carry up to 1600 lbs payload, both "best in class," and offer the same transfer cases, axles, optional electronic diff lockers and electronic front sway bar disconnect that are available on the JL Wrangler. The images leaked by the Gladiator Forum are purported to be official promotional images from Fiat Chrysler's media site, which were briefly uploaded and made public before being taken down—though not quick enough to avoid being noticed. Looking closely, we see that the Gladiator pickup appears to be available in both Rubicon and Sahara trim, with either a hard top or folding soft top, though it seems the pickup will only be available in four-door body style. The pickup bed measures five feet, with integrated power source and cargo tie-downs, and judging by what we see here, the doors will be removable and the windshield will fold down, exactly like the JL Wrangler. Enabling that muscle is a 3.6L Pentastar V-6 we presume is carried over unchanged from the Wrangler. In that application, it makes 285 hp and 260 lb-ft of torque and achieves 18 city/23 highway/20 combined mpg with the eight-speed automatic. We predict the slightly heavier Gladiator will likely lose a tick or two in all metrics compared to the Wrangler, but those numbers might still do fairly well against the Chevrolet Colorado and Toyota Tacoma, the former of which hits 17/24/20 and the latter 18/22/20. The leaked photos show that Jeep will offer the Gladiator in at least two trim levels: an unidentified luxury grade and the off-road–ready Rubicon. The latter will feature Jeep’s rugged Rock-Trac 4x4 system, along with Tru-Lock front and rear axle lockers and a segment-exclusive sway-bar disconnect. Setting aside the truck’s less favorable breakover angle, the Gladiator Rubicon should be every bit the equal to the smaller Wrangler Rubicon when it comes to tackling off-road trails—that is to say, very good. Jeep reportedly claims a fording depth of 30 inches and “unmatched crawl ratios” from that Rock-Trac transfer case. We’re curious to see how it will perform compared to the Colorado ZR2, which features some slick suspension technology but has a few low-hanging bits that compromise ground clearance somewhat. Forum members commenting on the leak suggest that order banks for Jeep’s first pickup in nearly 30 years will open in January or February, with dealer deliveries happening as early as April. Pricing likely won’t be announced until December or January, but we predict the Gladiator to start at $2,000-$3,000 more than an equivalent Wrangler Unlimited. If we’re right, a loaded Gladiator Rubicon could cost—gulp—more than $55,000. But put another way, perhaps a Gladiator could take the place of your Wrangler, old pickup, and sporty convertible. Looked at it like that, the truck could be a bargain. 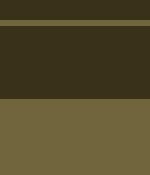 Last edited by Jimmyb; 15-11-2018 at 10:56 PM. Last edited by Jimmyb; 15-11-2018 at 10:55 PM. I like it. Showed it to a guy at work who is thinking about a dual cab....he loved it. I think it'll be a winner.